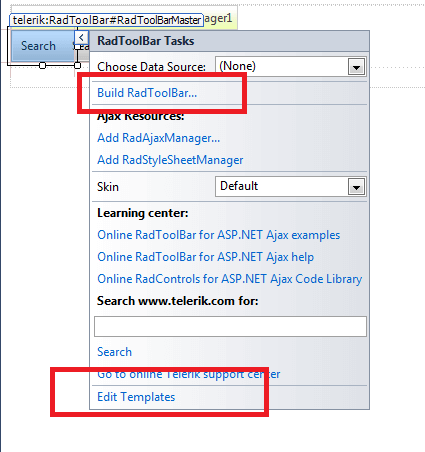 With RadToolBar it is really easy to add and edit templates at design time. The steps below describe how to add a textbox to a toolbar button and how to set its Tooltip property. Click on RadToolBar's smart tag and choose Edit Templates. Click on the buttons' dropdown and choose the button for which you will add a template control. Drag a control to the template surface and right-click on it to show its properties dialog. In this case, we add a textbox control and set its ToolTip property. Finally, click again on RadToolbar's smart tag and choose End Template Editing.